In December of last year, we published an interview with Dale Vince. In case you are not aware, Dale Vince built up a renewable energy company in the UK, Ecotricity, which is a not-for-dividend company, and has as its aim not just to make a profit but to use the money it makes to invest in more renewable energy systems and schemes to enhance the environment both locally and nationally. Dale also initiated and developed a rapid charging network for electric vehicles on the motorway system starting in 2011, and is therefore mainly responsible for enabling a market for electric vehicles in the UK. He is therefore a very important figure in the cleantech world, and we were very privileged to be allowed an extensive interview. 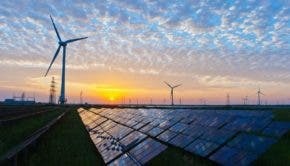 We consider this such an important interview that we are running it again, because, as you know, we publish such a lot of high quality content every day, that it is easy for people to miss important things, so we are giving everyone a second chance to catch this interview with one of cleantech’s giants. Rather than just repeating what we published before, I will be breaking the interview up into separate parts, and will run a series of articles, which will include some new material, by way of a review of what was discussed, has happened since, and what we can look for in the future. I am starting the series with the fascinating story of how Dale started with absolutely nothing and without borrowing from banks or having shareholders to cater to, and then built up a multi-million-pound business in the renewable energy and e-mobility sector. Dale Vince, the founder, and Managing Director of Ecotricity, gave this interview on 16th November 2017, and I am very pleased to present the first part of it here for those who missed it. Q: It is great to be invited to do an interview with you, as you are something of a hero in the clean-tech world. Zach Shahan, the director and editor of CleanTechnica, has asked me to extend the thanks of all in that organization for all that you have done. I can certainly second that, as I have been able to move to an electric vehicle only because of the Ecotricity charging network. Also, it is great to be able to buy 100% renewable electricity and gas, and to know that the money from my bills is being used to provide even more renewable energy systems. Yeah; I had no idea what it was going to take, but then it was an entirely new industry. My beginning was to try to build a big windmill on the hill I was living on. It was just at the start of the wind industry in Britain, in 1991. I’d seen the first wind farm built in Cornwall. I knew about little windmills, and I thought, I had got back in, because I had been 10 years living off-grid, and having got back in, would try to build a big windmill. I didn’t really even think it might be difficult, or something like that, but just thought that that is what I should do. Then I decided to learn everything about grid energy – technology, planning, grid, finance, and that kind of stuff. It took five years to build the first one, and by the time I’d done it, I’d learned everything. Not wanting to sound as if I’m blowing my own trumpet, but I had learned every step of the process, and that became a blueprint for Ecotricity, and the things we did next. And the money? Really, I had none, at the start. It was very fortunate that the first thing I needed was a wind monitoring tower. I didn’t have the money to buy one, but I had the means to build one, because from when I was a traveller, I had accumulated trucks, welding equipment, metal cutters, and all sorts of stuff. I even had a crane. So, I made a tower; put my own one up, but then a farmer in Swindon wanted one, and then someone in Bristol wanted one, and then Scottish Power wanted a whole series of them. It became a business, and it paid for the next steps in my project. So, I could start off by getting the mast up, and then I needed to get a planning application. The mast, by the way, was to collect wind data, which I needed for the business plan, and then it was back to negotiating a grid connection, and all sorts of other stuff. Along the way the mast business grew, and paid for everything. I was ready to build the windmill. I had made enough money from the mast business to put down a deposit of 20% on that first windmill, which I built myself; well, not exactly built, but project managed the whole thing, and therefore learnt all about the construction process, the whole scheme, right down to the foundation. The next part of the journey really. In 1995 I could see that I wasn’t ready to build the windmill that was to come in 1996, so I went to see the power company, the MEB (Midlands Electricity Board). They were the monopoly buyers at the time. That was before the industry was liberalised. What I thought was, this first one was going to get built, but to build more I really needed to get a fair price for the power, so I went to the MEB, and asked them the questions, and they laughed at the idea of green electricity, and they said, who wants it? Who is going to pay for it? They mentioned a really rubbish price, and this is what we’ll pay you. I left that meeting thinking that the best thing I can do is to become an energy company. But again, like building the windmill I didn’t think how difficult it was going to be, but just thought it was what needed to be done. As I’ve said often in the recent past, if I knew how hard it would be, I might not have done it. (laughs) It’s been a bit of a journey. But it’s probably the best thing I’ve ever done; the most exciting, the most impactful thing, at the same time. So, I applied to OFGEM (Office of Gas, and Electricity Markets) for a supply license, just to approve to market to people, around 1995. I just filled in a two or three-sided paper form, and faxed it to OFGEM. It was that easy to get a licence – no systems required, no money in the bank, or anything. So, we started then, and it was later in 1996, that we first supplied Cheltenham and Gloucester College. We did it from a local landfill site. We pioneered this concept of local energy supply, and that also became possible on that day. Under new grid rules you were able to set up generation and demand within the same network district. So, yeah, all that kicked off on 1st April 1996. We began to supply energy to businesses first, and built up quite a few of those. I think one of our biggest breaks came in 1997, maybe ‘98, when we did a deal with Thames Water. It was just monstrous. We went from almost nothing, to a £50 million turnover in one year, and we were buying power for them in the wholesale market, and they were massive users of electricity. That went on for a couple of years, before it went pear shaped. Then, we built a series of projects which were merchant wind-farm projects for industrial users. The first one, I think, was in 2000, for Sainsbury’s, and that was kind of a new model that we had come up with, whereby, if you build generation deeply embedded on the customer’s side of the meter, you avoid transmission and distribution losses and costs, and it’s a much more economical way to supply. Industrial sites don’t tend to be the windiest, but those economics have been deeply embedded to off-set that, and we’ve made it work. So, we built one for Sainsbury’s, and then we went on to build one for Ford. They liked it so much, I think we’ve got three for Ford, now, supplying a diesel engine factory at Dagenham. We built one for B&Q, Prudential, two sites for Michelin in Northern Ireland, and these days, it has become quite a popular concept. These days, people call it the PPA (Power Purchase Agreement) model. Typically, these are off-site, what we call ‘off-site merchant windfarms’. We did one of those for the Co-op bank in 2005, where we built the windfarm on one side of the country, and powered their offices in Manchester. It’s a much more complicated business supplying homes. When you’re supplying businesses, they have a half-hour metering system, and everything, including the shape (pattern) of their (electricity) demands are actual, and it’s kind of a simpler model. When supplying domestic customers, you’ve got to force a shape; people have profiles for their consumption. The meter doesn’t measure at half an hour, which is the resolution point of the British electrical system, so you take a reading and force it into a shape. I know that sounds a bit complicated, but that’s what supplying domestic customers is. It’s a very complicated business, but we have always wanted to do it, and so we went into it in 2003, and we’ve never looked back. I think it’s fundamentally about our approach. A lot of businesses, not just in energy, see customer service as something that they have to get through, you know, to provide a bare minimum service, to tick a box, and move on. We look at it completely differently from that. We deliver customer service according to our own ethos; the one that we have as a company, that guides the way we work, the way we treat each other, and the way we treat our customers, both business, and domestic. At the heart of it is simply treating other people the way we would like to be treated ourselves. When that comes to customer service, that means answering the phone, not having it done by recorded messages, not having an option of numbers to press depending on what your issue is, but answering the phone ourselves, sorting things out, keeping our promises, and basic human decency stuff. Our aim is to provide very good customer service, not just to get past the customer service need, as many other businesses do. So, we are stopping there for this first installment. More later. It seems clear that the way Ecotricity got started without the dead hand of financiers to corrupt its aims, is through Dale’s self-sufficiency built up over 10 years of living independently, off-grid, traveling where the mood took him.. He has developed the mindset of being totally self-reliant, and developed the practical skills to do everything himself. He must have been a strong character from the start to be able to live independently for such a long time. That enabled him at so many times to fearlessly go ahead, as he said, to do what he thought needed to be done. Elon Musk might be talking about taking Tesla off the stock market, but Dale has always been running his business as a private not-for profit affair, so avoiding outside interference in the running of the business and in setting its goals and priorities. Dale obviously has a real commitment to ethical business and environmental conservation. He has arrived at a position where he is able to use what has become a major force in UK energy to further those aims, which must be truly marvelous to do. Whereas I can write about these things, and get indignant about inept business-as-usual governments and big money exploiting the people and the planet, he can set up projects to actually bring immense environmental benefits, and show people that business can be a force for good, given the right direction, and a moral compass, which so many big corporations sadly lack. His mission of “turning bills into mills,” to use the revenues from his energy business, Ecotricity, to create new on-shore wind farms, has been somewhat thwarted by our perverse Tory government, which have effectively banned new on-shore wind farms in England. He has diversified by developing the “gas from grass” scheme, which produces bio methane for the UK gas-grid, using grass harvested from marginal agricultural land. This scheme also gets feedstock by encouraging farmers to rest prime land with a season of growing grass, which breaks pest, and disease cycles, and enriches the soil. Another project has been the launch of a mobile phone service provider, where profits are pledged to be used for buying land to create wild-flower meadows, as sanctuaries for pollinators currently under threat. Presumably, when it comes to mowing time, the grass can be used for making more gas, too. Much of his time and energy has also been taken up with his attempts to create an “eco-park” outside Stroud in Gloucestershire, where Ecotricity has its headquarters. 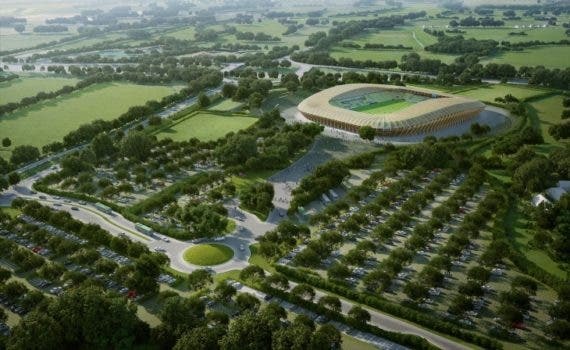 There have been many bureaucratic hurdles to navigate, but it looks as if planning permission is not far off being granted for the first part of the roll-out, which includes a 5,000 person capacity stadium for the Forest Green Rovers soccer club, designed by world renowned architects Zaha Hadid and made almost entirely out of wood. It’ll be the first of its kind in the world. A site being vacated in the move is also an Ecotricity project to build low carbon housing for people in the area. In the meanwhile, Ecotricity remains a strong player in the 100% renewable generation and supply markets in the UK, continuing to provide customers with 100% renewable electricity and gas, and a platform for support of new ecological initiatives from Dale’s ever fertile mind. Our next article will be about Dale’s creation of the Electric Highway fast charging network in the UK, on our motorway (freeway) system from as early as 2011.